Big bellies, even bigger hearts - that is how Northants like to sell themselves these days. They love the attention they get for some of their stars being slightly more rotund than you may expect, with the players jokingly using the phrase ‘big belly sixes’ on social media. And ‘The Units’, as former England batsman James Taylor dubbed them last season, are now a serious unit. In the build-up to this campaign, they’ve been given the new tag of ‘The Crazy Gang’, reflecting the things they have achieved with what some may see as an unorthodox squad and shoestring budget. But whatever you want to call them, there is no doubt that this Northants team has some serious talent in it. They claimed NatWest T20 Blast glory last summer, defying the odds to shock counties who have far more cash. Not only that, but they were a whisker away from making the semi-finals of the Royal London One-Day Cup, with only the timeless class of Kumar Sangakkara denying them as Surrey squeezed home at the County Ground. And David Ripley’s men, unfairly criticised by some for not taking the championship seriously enough, got better as the four-day campaign went on, finishing in fine style. They will hope to improve on their fifth-placed finish in the longer format this time round, and steering clear of injuries will again be key. They have already lost Muhammad Azharullah for four to six weeks to an ankle injury and will hope that is not a sign of things to come. Because if Northants get a bit of luck in the injury department, there are few limits to what they can achieve. In Ben Duckett, they have one of the best batsmen in the country, with the talented 22-year-old now firmly on the England radar. But as skipper Alex Wakely said in the build-up to the new campaign, there are any number of players who could emulate Duckett’s success this season. In the batting department, the likes of Rob Newton, Rob Keogh, Adam Rossington and Wakely himself will hope to score big in the championship. And in the white-ball competitions, there are few better in the county game than the likes of Josh Cobb, Richard Levi and Rory Kleinveldt, who can also bowl a bit, you know. As for those tasked solely with getting the wickets, Ben Sanderson and Richard Gleeson have just got better and better since being plucked from relative obscurity. Graeme White is another man whose improvement has been stark of late, earning him an England Lions call-up. And captain Wakely is expecting big things from new recruit Nathan Buck, who is ready to get his career back on track after a spell at Lancashire. The start of the new season can be savoured. Memories of last year’s superb campaign still surround the Steelbacks and there is no reason why they can’t do it all again. Under the shrewd guidance of David Ripley, this is a team to get excited about. Ex-Nottinghamshire star Taylor has joined the coaching staff for the One-Day Cup campaign, with David Sales also enlisted as a part-time batting mentor. Being able to tap into the knowledge and experience of those men can only be beneficial to Northants and, in particular, young players such as Max Holden, the Middlesex loanee, and Saif Zaib, the Academy product. 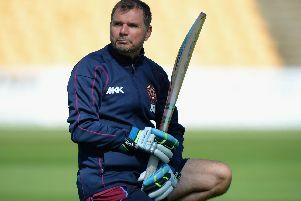 The future certainly looks bright, but the recent past and the present also provide plenty of reasons to be positive about Northants as the new season begins.